The warmer days, fresh flower blooms, and final squashing of the winter blues make spring the ultimate season of renewal and rejuvenation. And there’s no better way to kick off this refreshing season than by hitting the restart button on your interior. Of course, interior updates always sound great in theory, but they can be a little overwhelming in practice. If you’re at a loss for where to begin, start with this season’s ultra-uplifting color combinations and build out from there. This spring is particularly exciting on the color front because there’s something for every style sensibility. Those who crave bright and bold pops of color will be delighted by the abundance of striking hues, like sunshine yellow and vibrant turquoise. Meanwhile, folks who prefer a more quiet and subdued look will find a wide range of rich and compelling neutrals, like soft pinks and soothing sage to play with. We’d be remiss if we didn’t kick-off spring’s color trends with Pantone’s color of the year: Ultra Violet. An unapologetically vivacious shade of purple that will add pop and pizazz to any space. Because this hue makes such a striking impact, it’s best to pair it with more subdued, grounding colors to ensure it doesn’t overwhelm your space. And there might be no better complement than the cool, calming undertones of gray. Turquoise is another unapologetically lively hue that’ll be making major waves in the interior trend scene this season. And you can apply it much like you would Ultra Violet. Warm, organic colors like beige and off-white serve to highlight turquoise’s striking impression while keeping it grounded in warm sophistication. The cheerful color of sunshine yellow is uplifting spaces far and wide this season, and homes everywhere are much happier for it. Pair it with light and bright white for the ultimate cheerful impact. And while you can certainly put this combination anywhere in the home, it works particularly well in the kitchen as it’ll give you an uplifting boost out of the morning fog. Different shades of blush have been pretty popular in recent years, and this season is no exception. That said, the blush this season is slightly more sophisticated than in seasons past. Rather than being Easter-inspired, this spring’s blush is a bit darker and more neutral, lending calming, sunset vibes to looks. And because it’s a more neutral hue, it pairs perfectly with similarly warm neutrals like deep beige, copper, and natural wood. If you’re in the mood to make a major style statement, then look no further than vibrant red combined with black and white. This spicy color combination is equal parts striking and contemporary, and it’ll infuse any space it’s in with an eye-catching, modern flair. It’s no secret that millennial pink has had a serious moment and the striking color will continue to move through this season with much stronger and more layered versions of itself. Rather than one pointed shade, millennial pink is shape-shifting into a series of powerful hues that drop gender limitations and leave us with uniquely empowering designs. Layer it on in different forms like this for maximum impact. Those who prefer quieter color palettes will love the peaceful shade of blue that’ll be everywhere this season. In addition to being a hue that works in virtually any aesthetic, it’s also one that can be glammed up in a cinch. Adding gilded accents to this color is a no-fail way to refresh your design with a hint of playful glamor. It's also a timeless combination that will look great for many seasons to come. Sage is one of those rare hues that can truly be mixed with nearly any color under the sun and still look stunning. 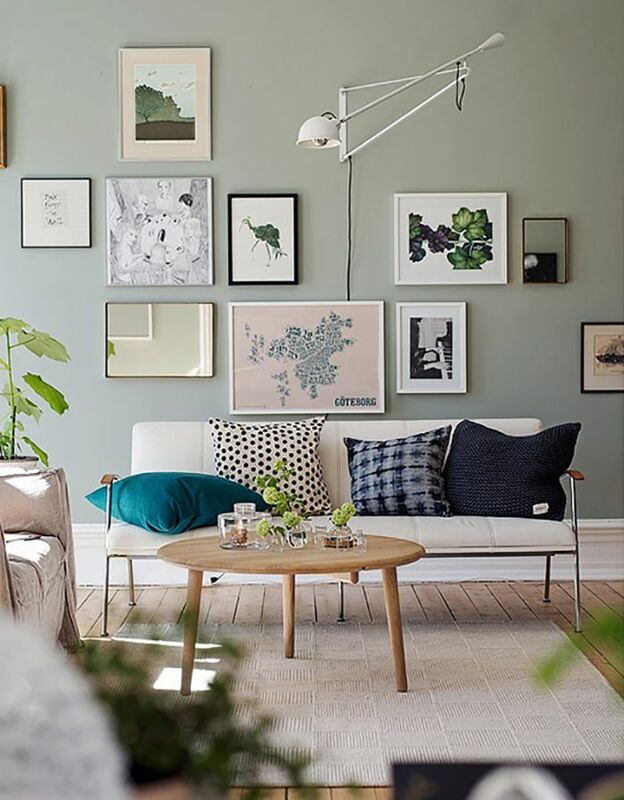 Pair it with black for an edgy vibe, complement it with soft pastels for a feminine look, or make it the backdrop of a gallery wall like this one for full-on interior perfection.